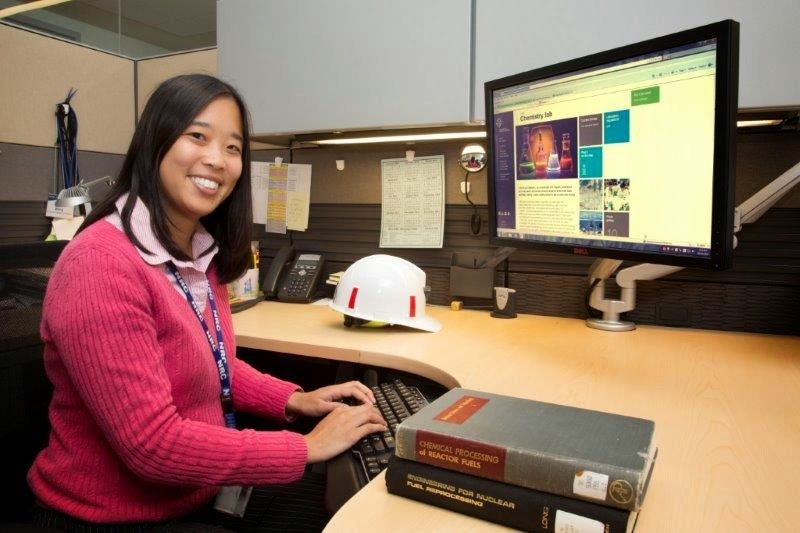 Alumna Emma Wong (MS Chemical Engineering '04) works in the Spent Fuel Alternative Strategies Division of the United States Nuclear Regulatory Commission. The NRC featured Wong in a recent post on their blog. One of the questions is excerpted below. But before we get there, here are a few insights from Wong, via a conversation with her on LinkedIn. The whole MS curriculum [in chemical engineering at UC San Diego] proved to be most useful in my current job. Incompressible flow, numerical methods, reaction engineering all help in my understanding of current methods, modeling, and concepts for systems I am reviewing. The most interesting thing about chemical engineering is that it can be used, in my perception, in many different fields. I have worked in electrical areas, energy sectors, processing, materials.... and many of my chemical engineering friends have branched out with their degree and have succeeded. Check out the original blog post for the full Q&A and keep reading for one of her thoughtful responses. And if you're not a member of the Jacobs School of Engineering group on LinkedIn, you can request to join here. What advice would you give to girls/young women considering a career as an engineer? Don’t be afraid to try new things, such as different types of engineering majors, internships. Keep trying until you find what fits best. Besides knowing what you want to do, it is also good to know what you don’t want to do. Have multiple mentors and advisors. As you grow, don’t be afraid to find new mentors who fit your current needs. Besides, it’s always nice to have someone to talk to. Engineering and science are not scary. All the numbers, symbols, and complex equations may make it seem that way, but all engineers and scientists had to start somewhere — one equation and theory at a time. Being an engineer is a good career path. But if you find out later that something else fits better, an engineering education is a good foundation for many other careers, including medicine, law, business and regulation. We recently visited the laboratory of Geno Pawlak, a professor of mechanical engineering here at the Jacobs School. Pawlak's laboratory is home to a flume, essentially a water tunnel, used to study different types of flow. Pawlak gave us a demonstration of the flume. Check out the video and prepare to be hypnotized. Pawlak's research focuses on the turbulent mixing processes that happen at the coast and in estuaries. Join us at this one-day forum. Explore the future of ubiquitous consumer robotics and its potential to revolutionize medicine, agriculture, environmental monitoring, disaster response and more. This interactive event includes multiple networking sessions with speakers, UC San Diego faculty and attendees. 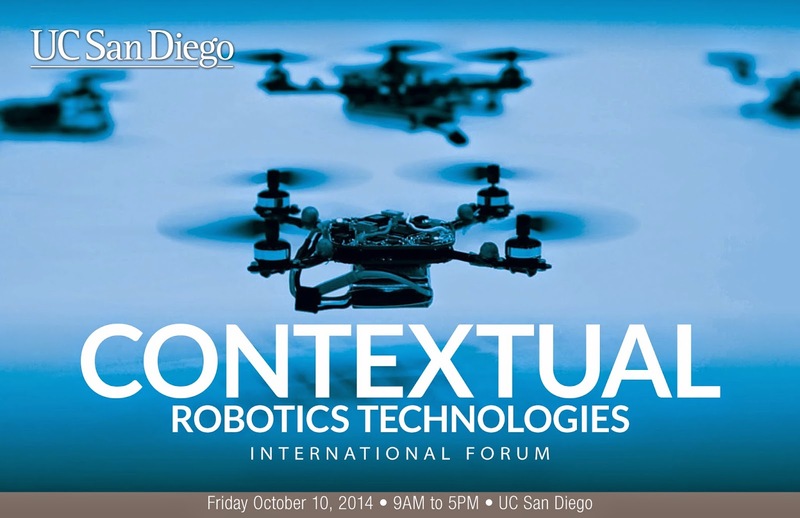 Learn more about UC San Diego’s vision and plans for robotics research and technology development. UC San Diego NanoEngineering professor Liangfang Zhang and a team of collaborators have a paper this week in PNAS entitled "Clearance of pathological antibodies using biomimetic nanoparticles"
"Jonathan Copp et al. (pp. 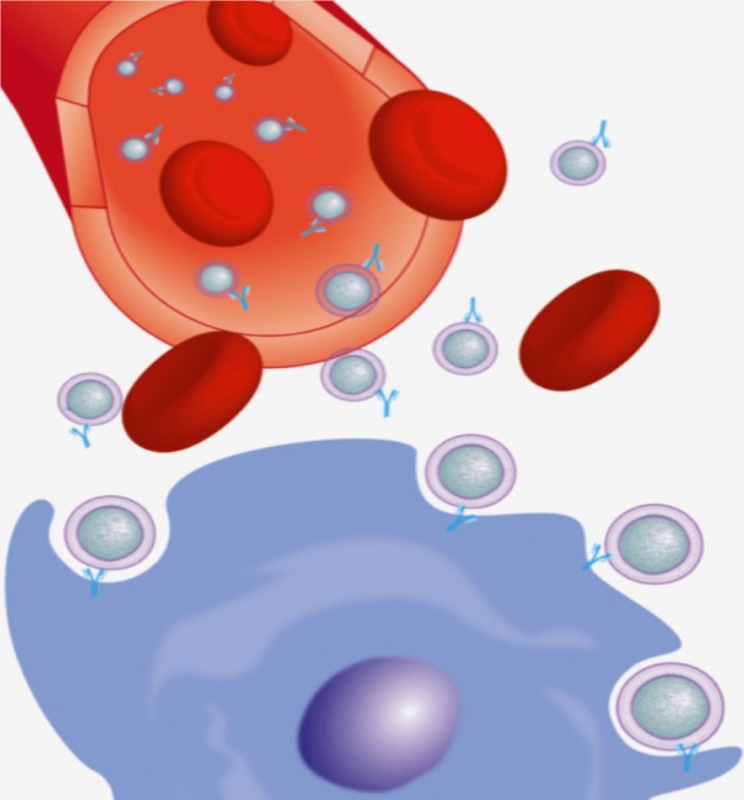 13481–13486) tested whether nanoparticles could act as decoys to lure potentially destructive IgG antibodies away from healthy red blood cells in a mouse model of antibody-induced anemia. The authors coated polymer-based nanoparticles with red blood cell membrane, consisting of molecules that are targeted by anemia-causing antibodies." Visit Liangfang Zhang's research group on the web: Nanomaterials & Nanomedicine Laboratory. These researchers are also affiliated with the UC San Diego Moores Cancer Center. UC San Diego students can attend CommNexus event for free. Keynote: Steve Mollenkopf, CEO Qualcomm Inc.
UC San Diego Jacobs School of Engineering students, you can hear (for free) Steve Mollenkopf Chief Executive Officer, Qualcomm Inc. give a talk discussing where the industry is going at an upcoming CommNexus event on Friday Oct 3. And Mike Tolley, soon to be a professor of mechanical engineering here at the Jacobs School, does it again. This time, he presented a soft robot that uses controlled explosions to jump at the IROS 2014 conference in Chicago this week. The three-legged robot made of silicon rubber is propelled by a butane-oxygen reaction. Check out the video to see it in action. Cool slow-motion shots start a little bit before the one-minute mark. Full IEEE Spectrum story here. Miroslav Krstic, professor of mechanical and aerospace engineering and associate vice chancellor for research at UC San Diego, has received the triennial Chestnut Textbook Prize awarded by the International Federation of Automatic Control (IFAC). Krstic also serves as Director of the Cymer Center for Control Systems and Dynamics at the UC San Diego Jacobs School of Engineering. He received the award in Cape Town, South Africa, in late August. The award honors the memory of Harold Chestnut, the founding president of IFAC (1957), president of IEEE (1973), and member of National Academy of Engineering (1974). IFAC, founded in 1957, is a multinational federation of national member organizations representing the engineering and scientific societies concerned with automatic control. The federation promotes the science and technology of control systems. After the 6.0 Napa Valley earthquake struck in the early morning on Aug. 24, structural engineering professor Falko Kuester took a team of his students, and their drones, to investigate the damage. NBC Bay Area profiled their work in this video. "As tragic as this seismic event this earthquake was, it is also a very powerful learning tool which allows us to study how buildings have responded to the ground shaking -- how they've been damaged." A Jacobs School alum has launched a Kickstarter for a GoPro mount for bikes, canoes, and more. Yohei Yamamuro graduated with a bachelor's in mechanical engineering in the mid-1990s before earning an MBA from USC. An avid mountain biker, he came up with the idea for the mount, called Talon, while trying to position and hold a fluid dispensing nozzle. The Kickstarter project, which has 27 days to go, is currently at about $3,400 raised of its $20,000 goal. In hindsight, MAE 156A&B prepared me tremendously for the “real” world. Since we had one project, a miniature outdoor blimp with a gyroscopic camera, the class divided itself into teams. We had design teams for the major components such as chassis, engine, camera systems, and blimp. I chose to be on the project management team—and it was quite a revelation where up to that point most academic activities focused on individual versus collaborative performance. Managing a team effort and all of its advantages and perils helped lay the foundation for who I am today, a technology commercialization and industrialization leader. I am a lifelong learner therefore I have had many favorite classes and professors including: Instructor Dave Tribolet for MAE 156A&B, Professor Vecchio for MAE 11, Professor Hegemeier for MAE 121A (Statics), Professor Pao Chau, Professor Nemat Nasser for Differential Equations, Professor Miller for Thermodynamics, and many, many more. Michael Tolley, the Havard postdoc who is set to join the Jacobs School faculty in November, strikes again. Last month, Tolley was part of a team that created origami robots capable of folding onto themselves and moving. This month, he is the lead author on a paper that describes a soft robot capable of withstanding flames and walking through snow. The robot bounces back even after being run over by a car. In the video above, the robot is equipped with a camera and walks about a lab to find a hidden laptop. More coverage in IEEE Spectrum and the New Scientist. 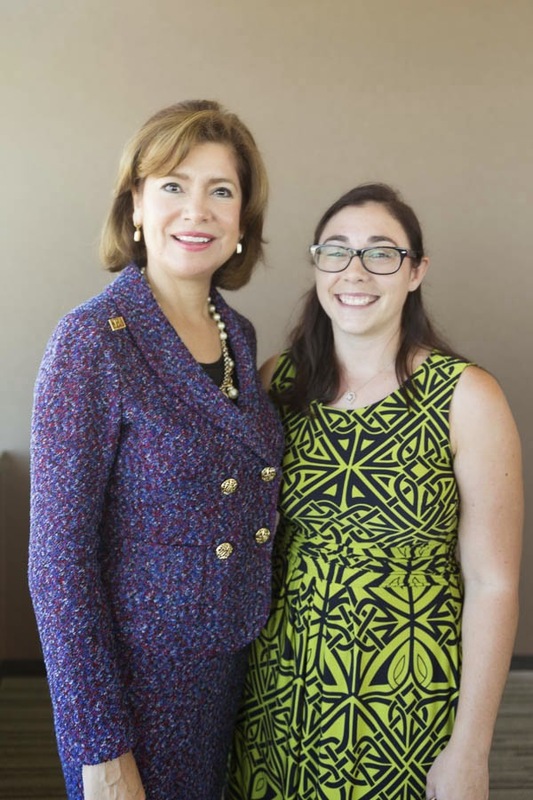 Administrator of the US Small Business Administration Maria Contreras-Sweet and UC San Diego computer science PhD Sarah Esper are pictured below. 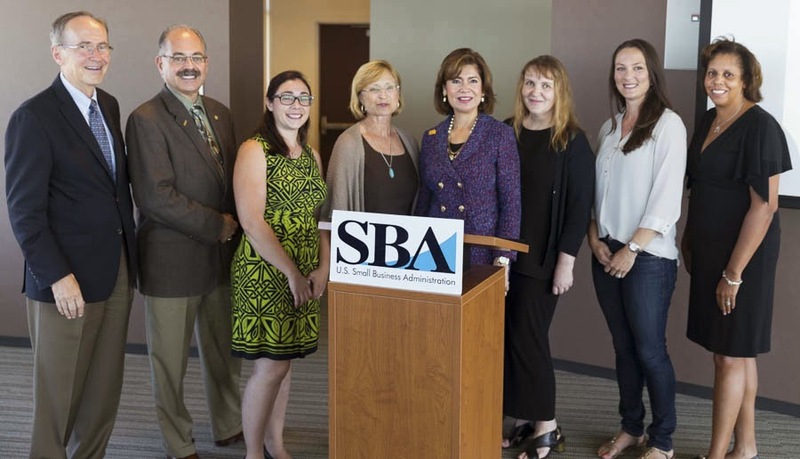 The photo was taken last week at a campus event announcing a grant from the US Small Business Administration to mystartupXX and to the 49 other winners of the first Growth Accelerator Fund competition. The mystartupXX mission is to promote female UC San Diego students interested in entrepreneurship and help them to pursue their dreams of starting innovative, scalable, technology-driven companies. MystartupXX is a collaboration between the Rady School of Management at UC San Diego and the von Liebig Entrepreneurism Center at the UC San Diego Jacobs School of Engineering. Initial funding for mystartupxx came from the National Collegiate Inventors and Innovators Alliance. Read the full story here on the new SBA grant, and learn about ThoughtStem, the computer science education startup that Esper co-founded and mystartupXX funded. 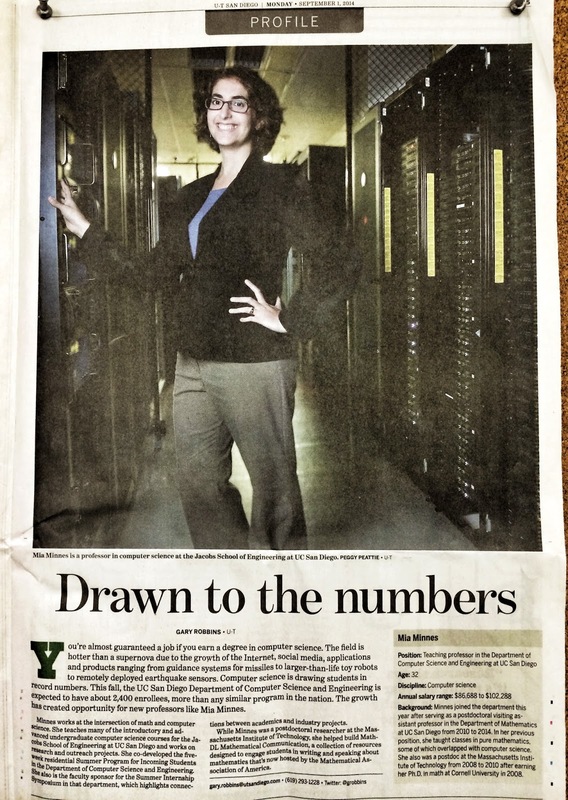 Congratulations to computer science teaching professor Mia Minnes, who is featured in the Labor Day issue of UT San Diego! Minnes was hired this year after serving as a postdoctoral visiting assistant professor in the Department of Mathematics at UC San Diego from 2010 to 2014. In addition to teaching many introductory and advanced undergraduate classes in the department, she works on outreach and research projects, including the five-week residential Summer Program for Incoming Students, which she co-developed. She's also the faculty sponsor for the Summer Internship Symposium for the Department of Computer Science and Engineering.